The flowers used by our Methlick Florists for all your bouquets have been cultivated and then imported directly to us from our suppliers in Holland, a region of the Netherlands well-known for its amazing quality of flowers. Combined with up to four deliveries per week, not only are our flowers of premium quality but they are also the freshest with a high longevity which means that your loved one can enjoy their flowers for many days to come. Our cultivators supply us with a huge variety of flowers such as elegant calla lilies, traditional roses in different colours, exotic gladioli and orchids amongst many others so our Methlick Florists are able to create a huge variety of bouquets perfect for any occasion. Our Methlick Florists are able to cater for all occasions ranging from birthdays to congratulatory events all the way to larger scale occasions such as weddings and funeral as well as any other imaginable occasion. Our Methlick Florists expertly arrange flowers and dense, lush greenery such as eucalyptus leaves, striking the perfect balance between the two and creating a gorgeous contrast which highlights the beauty of the flowers. Once the body of the bouquet has been arranged to perfection, our Methlick Florists use a selection of papers, tissues and ribbons to finish off our bouquets with an artistic flourish. Alternatively, our Methlick Florists can also place your flowers into a nice vase or box or even a teacup depending on what you want. 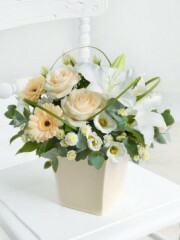 Once the bouquet has been fully arranged, you can personalise your bouquet by adding a personal message. Some of flowers also come potted, for example like our orchids. No matter what you're looking for, we are positive our Methlick Florists are able to provide you with the perfect bouquet that is bound to bring a smile to your recipient's face. Once your order has been fully organised by our Methlick Florists, we offer our customers a few different delivery services to choose from if you are unable to personally collect your flowers or if it's simply easier to deliver your flowers. We have our standard delivery which runs weekly every Monday to Saturday, our next day delivery as well as our same day delivery. The same day delivery service means our Methlick Florists organise everything on the day as you place the order on the day of delivery. If you wish to use this delivery service, your order must be placed before 3PM to give our Methlick Florists enough time to arrange your flowers with the care and attention both you and the flowers deserve. This service is perfect for occasions which have occured suddenly or for those who like to spontaneously surprise loved ones. 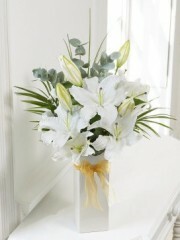 Distance is also not a problem as we are part of the Interflora delivery network which means we are able to deliver not only locally but nationwide all over the UK as well as abroad to over 140 different countries worldwide so even if you are unable to be with your loved one during their special occasion, your flowers will still reach them in pristine condition to your desired location. Want our customers to know that our Methlick Florists want your order with us to be us fuss-free as possible which is why once your order has been placed, our Methlick Florists take care of everything on your behalf.